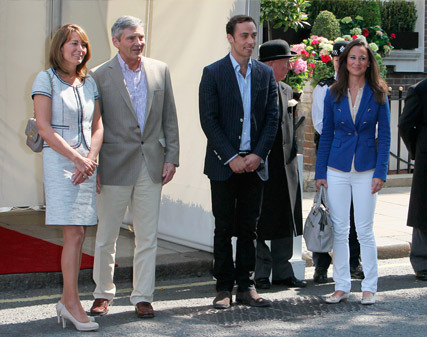 Pippa Middleton Latest: Family To Move To New York? Pippa Middleton could be joined by her whole family in her move to New York, if the latest rumours are anything to go by. Just days after it was revealed the youngest Middleton sister was thinking about a move stateside to promote her parents’ Party Pieces business, it seems the rest of her family are now thinking about joining her. It’s thought the potential US move has been prompted by overseas interest in their children’s party website, which began after the royal wedding last year. ‘It has prompted the Middletons to look at establishing an office in the U.S. so that they can bolster their brand and even tie into other companies and ventures,’ one insider told the New York Daily News. Now it seems that when Pippa Middleton was spotted viewing properties in New York last year, she was actually scouting out an office space for the growing business, not a home for herself. The family may be planning to move their business to the next level, but insiders say Pippa Middleton and her parents are treading extremely carefully, so they don’t attract any unwanted attention to royal daughter Kate. ‘The Middletons have been extremely careful not to upset Buckingham Palace by seemingly trading off Kate’s link to royalty,’ the source added.